This week has been a week of firsts for me. First time snorkeling with the kids, first time surfing and even my first time hitchhiking! These firsts occurred in Maui, Hawaii that is world renowned for its snorkeling and surfing because of the shallow beaches and wide reefs. Maui is also known for its dormant volcano Haleakala, rising 10,000 feet (3000m) above sea level, that is popular for sunrise tours. 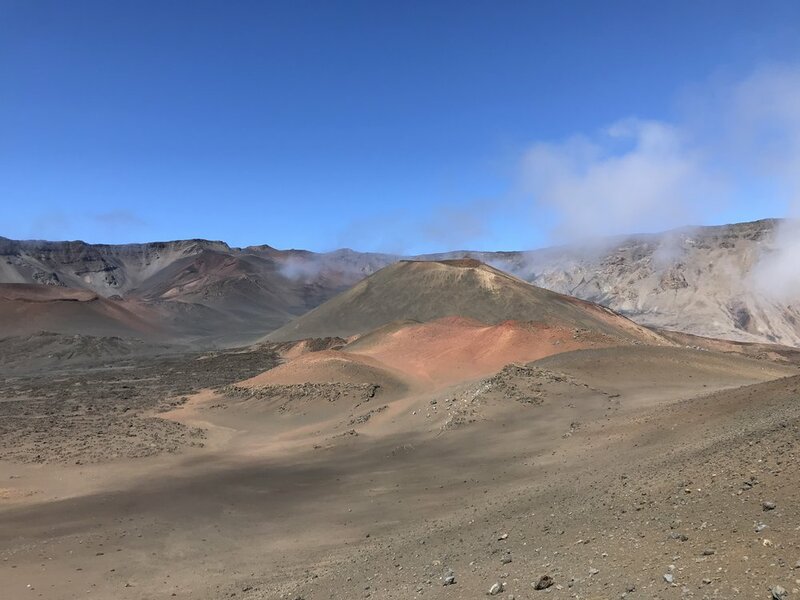 The reason for me hitchhiking the first time is that the trail into Haleakala is best done as a point to point from the rim of the crater back to a parking area part way down the mountain. My original plan was to run it as a loop by starting at the Halemau’u Trailhead parking lot, running 6 miles (10k) up the main access road then taking the 12 mile (20k) scenic trail back to my car. On the way into the national park area I stopped at the ranger station and asked the ranger about the road to the summit. He said it was a bad idea to think about running on the road because it is so narrow and has no shoulder, but that there is a designated spot for hitchhikers. So, hitchhiking it is I thought. I continued my drive to the Halemau’u Trailhead parking lot and parked my car. At this point in the day I didn’t see a lot of cars since most people are heading up to the crater in the very early morning hours to see the sunrise. I said to myself that I’ll wait for 10 minutes and if I cannot get a ride, I’ll just hike in and make the run an out and back. I walked over to the hitchhiking pull off area, nicely signed, and said to myself, “look friendly”. Since I’d never hitchhiked, I wasn’t sure if I needed to stick my thumb out, wave my arms, or jump up and down. It took only a few minutes for the first car to approach. They saw me, but had a confused look on their face as I gestured to them in my most friendly way. Didn’t even slow down though. The out and back option was looking a lot more likely. However, not 5 minutes later I saw the next car coming up the road, a late model mini-van with just a single person in it. I was thinking this car is looking promising, and sure enough he pulled over! I instantly knew I’d found the right guy since he was wearing running clothes, had his hydration pack on the passenger seat, and his Solomons were on the floor. At first I thought he was local, but he said, “going for a run in the crater, eh” and realized he must be Canadian. Fortunate for me, John, from Alberta, hadn’t researched the run quite as well and thought there was another trail starting from higher up the road that still made it to the crater. I didn’t think this was the case based on my Gaia GPS tracks, but said I’d take a ride anyhow cause that would at least get me part way up the mountain. We stopped for a moment at the last turnout before the summit and checked the map again on Gaia GPS. I convinced him there was no other option other than starting from the top. I offered to run with him so I could return the favor and drive him back to the top but he declined saying he would take his time taking pictures. Alone, I took off on the path starting at the entrance to the parking lot and in just 100 feet came to the edge of the crater. The view into the crater is one of the best I’ve ever seen. With some light clouds in the distance I could take in almost the entire area in a single look. I set off for my run descending quickly on the hard packed, and very runnable, path. About an hour in I stopped for some water and a Twix bar and along came John from Alberta. I’d taken my time on the way down with lots of photo opportunities so was easy to catch up with. We were standing at the juncture where the Sliding Sands Trail starts. The park ranger I met earlier in the day said the trail “wasn’t worth the time” so we headed directly to Haläli’i where we would loop around it. The ranger also said the loop around Haläli’i was one of his favorite areas. He was right, the view of Pu’u Kumu from the back side of Haläli’i was well worth the extra half mile of running. 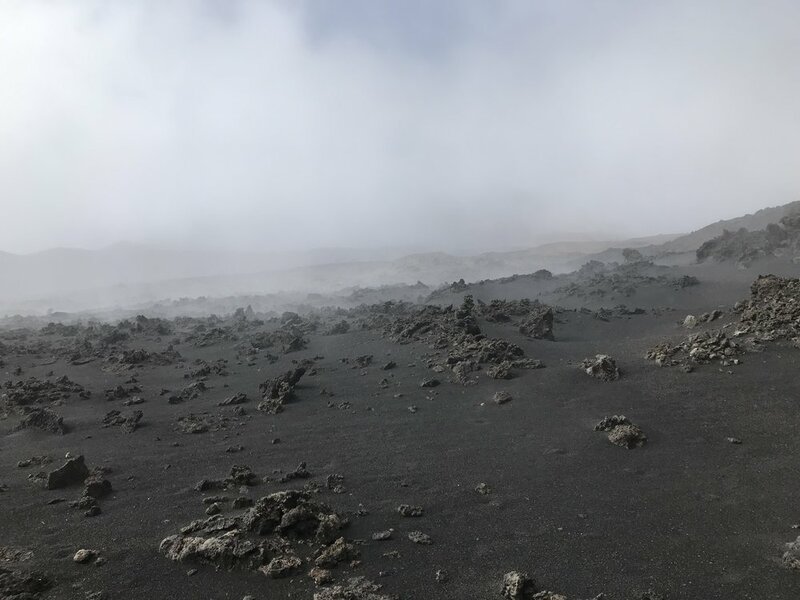 As we started on the Halemau’u Trail heading towards the Silversword Loop the clouds became thick. The clouds created an otherworldly landscape. John was whopping with excitement the entire time and kept saying he rarely got to do runs like this. It was fun to see someone enjoying themselves so much. We ran much of the remaining 5 miles (8k) to the switchbacks leading up to the trailhead. I’m sad this portion was in such heavy fog, that turned into a hard rain, since the views must amaze on a clear day. Even in the fog it was still an intense section of running since the switchbacks go straight up the side of the mountain with little space between you and the edge. We made it to the trailhead in the heavy rain and became cold quickly. I was glad I’d carried my normal set of safety gear with me (fleece, rain jacket and a long sleeve shirt) so I could change into something warm. It was also important to have in my backpack because a twisted ankle or other emergency would have become miserable, and unsafe, without clothing to stave off hypothermia. I drove John from Alberta back to his car at the top and then drove myself the short drive to the peak where the observatory is located. After parking I took the stairs to the observation point at 10,000 feet (3000m) but unfortunately the clouds were obscuring most of the view. Despite that, it’s cool to go from absolute sea level to 10,000 feet in one day. While my run was not ultra distance, this is still an ultrarunning destination for its total elevation gain and rapidly changing weather. It is also possible to add onto the run over 10 miles by heading all the way out to the Kaupö Trai trail. Some guidebooks refer to a trail of over 20 miles, The Grand Loop, since there are three cabins for backpackers to use. Check out the map at the National Park Service for more detail!